I regret to have to tell y’all that Bubba (the male painted bunting who spent 11 days at my feeders) has left. His lady is gone, too. The last time I saw him was the day he landed on my windowsill. I guess he wanted to let me know he needed groceries so he could fill up his little bird tank for a trip to someplace else. I miss him! It’s like a whole flower garden is gone; he was so colorful. We’re back to our brownish, grayish with a bit of green winter. I’m not seeing enough cardinals to make up for his absence. However, there are lots of other birds around here to appreciate. There is a flock of robins who are out in my backyard at this very moment eating Ligustrum seeds. I didn’t know they would do that. I always think of robins and worms, and I never see them on a feeder, so I just assumed they were carnivorous. I guess not. They sure are pretty. Have you ever seen one’s face straight on? I was looking through the binoculars and saw one of them turn his head so that his beak and eyes were what I was seeing. The way his markings are on his eyes and throat, he looked like a cartoon character. One morning, I opened the blinds to see a Northern Flicker up in a tree on the other side of my neighbors’ house. He is so pretty! And another morning, I saw a pileated woodpecker. We had one of those several years ago who was pecking at his reflection in side mirrors on vehicles in the neighborhood. He broke two of my dad’s mirrors down the street. My cousin (next door) saw it on a truck at his house and said he never would have believed it if he hadn’t seen it himself. That bird even saw his reflection in one of my windows and went after it. I was torn between shooing him away so he wouldn’t break the glass and staring at him in awe. I’d sure never seen a pileated woodpecker from just a few feet away! I guess you know I just watched him. No shooing here. Everybody I talk to is wondering why we don’t have many goldfinches. The most I’ve seen at once is nine. We have tons of sparrows. I like them but they sure like the expensive food. I got some safflower the other day, so they can eat more black oil sunflower seeds and just a little of the millet. That way the other birds can have something to eat without so much competition at the table. OH! There is still a lady rufous hummingbird coming to the feeder. She sure is hard to photograph! As soon as I get ready, she flies. Last time it warmed up she sort of disappeared, so I’m glad to still have her during this warm spell we’re having. Shoot, most of this winter has been a warm spell. Birds are singing like it’s spring. I wouldn’t get too comfortable though; I’ve seen snow on roses around here. ADDENDUM: I just saw the female bunting!! It’s now about 8am on the 21st of January, one day after writing the above post. Maybe Bubba is still out there!! It’s been a week since I’ve seen either one of them. Oh, wow. How cool! Tomorrow is the Big Day. There will be an internet blackout by some sites in protest of SOPA (Stop Online Piracy Act) and PIPA (Protect Intellectual Property Act). I won’t be online tomorrow. If I can figure out how to make my whole blog private I’ll do that, unless I figure out how to post a protest banner or something. The technical stuff gets ahead of me. But free speech, I understand. A lot has already been written about what this is and why folks are upset, so I won’t go into a lot of detail here. But for those of you who may live in other countries and don’t know what all the fuss is about, I’ll say this: We already have laws against content piracy with consequences for the thief. I’ve heard of people going to jail for downloading music illegally. In my opinion, that’s pretty harsh. What more do they want? Hollywood wants providers to be held accountable. So, sites that have something posted that has been stolen could be shut down without a trial or anything. We have already seen our government hold people in detention without charges, and now they have written it into our laws, so American citizens can be held indefinitely without charges. Last night in a political debate we heard Mitt Romney tell us we are supposed to trust him and President Obama with indefinite detention! We are mauled by TSA agents and exposed to radiation and humiliation by scanning machines at our airports in order to “keep us safe” while our Constitutional rights against unlawful searches are ignored. Our government has even had European governments protesting when they wanted the internet providers who are located in Europe to keep records of emails for longer than EU law allows. The laws in Europe concerning this take a person’s right to privacy into account. We are seeing our rights chipped away bit by bit. If they are able to pass these bills, or any others like them, we could see sites shut down supposedly because they contained pirated content, while the effect would be to stifle our ability to speak to each other concerning our government. Some of us can easily envision our government, who thinks we need to be humiliated at airports and held without charges, (and even more, but isn’t this enough? ), shutting down the internet site by site in order to keep public peace. I read that Occupy Wall Street set up their website in Canada to keep the US from shutting them down. See what we are facing here? I’m only one person, but I’m not the only one. Even if I was, I’d still protest. I’m going to go now and catch up on some email. I won’t be online tomorrow. ADDENDUM: I just read a blog by Reddit that explains a lot more about this than I previously understood. This is bad in so many ways. Here’s a quote: “SOPA and PROTECT IP contain no provisions to actually remove copyrighted content, but rather focus on the censorship of links to entire domains.” Please go here and read this blog; it’s really good! ADDENDUM II: I managed to get the Stop SOPA ribbon that WordPress provided on my Home Page. Now I’ll just clean a closet or do some art or something tomorrow. When the protest is over, I plan to come back and write about some birds. I learned that Mr. Painted Bunting prefers to be called Bubba. A few days ago, I was sitting at my indoor bird blind (down low behind a table) close to the window waiting for him to show up so I could practice taking video with this new camera. (I’m using the manual to take lessons on how to use it and it was video time.) The daylight was fading away and his colors were going to be muddy if he didn’t hurry up, so I said, “Come on, Bubba!” and there he was within seconds of me calling him. Yesterday afternoon I didn’t get the millet refilled. Or, the peanuts either, but there was plenty of black oil sunflower seed, thistle and suet and I knew I’d be getting up pretty early this morning, so I didn’t go out in the dark to refill millet and peanuts. This morning at about 7:30 I was in the kitchen when I heard a bird kind of flutter and thump at the window. I figured someone had landed to complain about the breakfast menu. (Sparrows seem to do that most often if there is no seed at all.) When I looked there was Bubba! I was shocked! He was on the windowsill looking inside the house. He has millet now. Dolly Parton must have what they call “staying power,” I guess. Remember the movie, Nine to Five, with Dolly Parton, Lily Tomlin and Jane Fonda? We took our oldest son to that movie when he was almost three years old. Not that we thought he would like it especially, we just didn’t have a baby sitter and he was a good kid. He made it OK through the first hour and a half or so, then he started fidgeting. He was in and out of his seat and squirming around. He kept standing up and flipping the seat up and down. I kept whispering to him to be still and be quiet. I told him he was making it difficult for the people behind us to enjoy the movie. Finally, in an angry sounding whisper, I asked him, “Do you want me to take you out of here?” Of course, he said, “Yes!” and the people behind us cracked up. So, I guess that movie would probably be his earliest memory of Dolly Parton. I don’t know what my other two sons’ earliest memories of Dolly Parton are, but I know they were very aware of a certain aspect of her in a way that little boys are when they were about six and seven years old. We were on vacation with my parents and these two little clowns came in our room to “show us something.” They squatted down with their knees up by their chests and pulled their t-shirts over their legs. Then they alternated their feet, up and down, up and down, which made their knees look like…uh,…well, you know. They said they were Dolly Parton. Sixty-five years old. She said (this was in Parade Magazine) that if she “sees something sagging, dragging, or bagging, I’ll have it nipped and tucked.” She said people will tell her she looks so happy and she tells them it’s Botox. Well, I think a good sense of humor keeps us young on the inside, so I reckon she’s still a youngster. Have you ever gotten a new camera, looked at it, and wondered, “How on earth am I ever going to learn how to use this thing?” I did. Got one for Christmas. If a gadget does more than two things, it’s going to be a learning experience for me. I have an idea though of how to go about it. One of the first things I learned is if you get a new camera, go ahead and get some extra batteries because the ones that come with it won’t last long. That’s just how it is. I did a bit of reading and learned that Lithium batteries are really good, but they are really expensive. We like groceries, so I won’t be going that route. Alkaline batteries don’t last very long, and I’m not interested in buying batteries often and having to pile them up while waiting for a Recycle Day for stuff like that. The ones I settled on are Ni-MH (Nickle-metal hydride) and they are rechargeable. I got them because someone who seemed to know what they were writing about said they were the best of the three options and it made sense to me. I got my batteries yesterday, charged them overnight and put them in the camera today. So, that is the first step. Next step will start tomorrow. I printed out the manual…oh, yeah. Print out the manual. They give you a little booklet with the camera, but the manual is online and you’re going to want that. I’m going to use my manual to learn how to use my camera. When I was in high school, I took two years of photography classes. The first things we learned had to do with how to use the camera. There were lessons on focus, lighting, speed…all the things you need to understand about how the camera works. I’m going to have my first lesson tomorrow with my new camera. I have taken photos since I got it, I just want to learn all the ins and outs. I’ll work my way through the manual using it like a textbook, learning each thing by taking photos and using the feature described, one right after the other and reviewing as well. By the time I get to the end, I ought to know this camera backwards and forwards, and be able to do what I need to do automatically when the grandkids start doing something I want to capture, or there is a rare bird on one of my feeders. Like those two? – is that green bird a female? – painted buntings today. That sounds pretty easy, doesn’t it? One lesson at a time, moving along at my own pace. I’m ready for tomorrow. If you have a new camera, don’t be intimidated by it. If I can do this, you can, too. 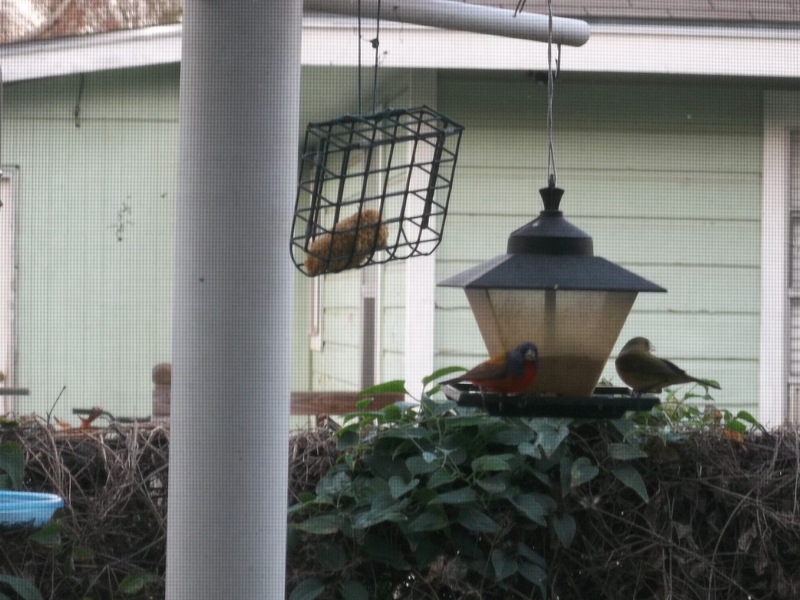 A Painted Bunting in January? My son saw it first. He came and got me so I could see him. (I was washing hummingbird feeders for the rufous ones we have this winter.) We had a male painted bunting eating Scott Superior Blend Wild Bird Food. It has mostly millet, which is why I bought it and that is what this colorful guy was eating. He’s not supposed to be here right now according to the books. I don’t think some of the birds read the books. I was so excited I moved too fast and too close to the window and scared him away twice, but he came back both times. The third time he landed on the feeder and sat there eating and chirping for five minutes while I made Bird Sighting Phone Calls and watched him. You can see what they look like here. Tomorrow, I hope to get some batteries for my new camera and I hope he comes back so I can get some photos of my own! ADDENDUM: I’ve learned that a painted bunting on the Gulf Coast in the winter isn’t unheard of. It is rare though. You know (if you have been reading my bird posts) we have been watching more than one hummingbird at our feeder the past few weeks. Last week, my son who carries binoculars and a bird book in his car, (my other two are what I would call ‘incidental bird watchers’ but this son is deliberate about it) was here to visit for Christmas. He took the window screen off so we could get a better look because we really need to see detail so we will know who we have here. He asked if I was sure that both of the hummingbirds were female rufous hummers. I told him I was wondering about one of them because I’ve noticed the throat is dark-colored, but not orange. (Females have a bit of what my friend likes to call “beading” on their throats, except our female’s throat is pretty much white. It’s rows of teensy tiny spots that go from their chin down the throat just a little ways. The female also has a dark spot below the “beading” that males don’t have. Males have a solid orange throat.) My son said it may be an immature male rufous. He noticed the rufous in front of his(?) wings goes back over his shoulders a little ways, too. This bird is also a little bit smaller than the aggressive one. A few days later in the week, my friend who has been watching birds for decades and is very good at identifying them, came to take a look. She said it’s possible that my son is right. We will have to watch and see if he(?) changes and begins to look more like the mature male. So, maybe we will be watching a little boy hummingbird grow up this winter. That would be so cool! Another thing I’ve noticed is that the female, who is so aggressive she chases off sparrows, has never showed up to chase this bird away when it is feeding. She does chase a hummingbird, but it’s hard for me to tell if it’s this one before it lands, or if it’s a different bird entirely. I’ll be getting some new batteries for our new camera in a day or two, and I hope to get some photos so I can compare these birds, especially their throats. Then, I want to learn how to put them on here so you can see, too. One more bird thing – yesterday, I finally saw two goldfinches on the thistle sack at the same time! Won’t be long and there will be a crowd. Winter sure is a great time for watching birds in the Southern US. I hope you are seeing some great things out your windows, too.